When is the evaluation available to students? Set up a timeframe in which they can fill it out. When can the course faculty see the evaluation results? You can let the faculty see it after 60% of the course's students have submitted evaluations, or you can restrict it from the faculty altogether. Both of these settings are meant to help preserve student anonymity. Do you want to lock grades for students who don't take the evaluation? Set a date by which student grades will be locked for those who haven't. Click Add a Course Evaluation. Give the evaluation a name. As soon as you save, you'll be taken to the evaluation's Design view. Go to the existing evaluation's Design view. Click Clone this course evaluation. Give the new evaluation a name. As soon as you clone, you'll be taken to the new, cloned evaluation's Design view. Evaluations are made of three basic elements: headings, text, and questions. You can also embed an existing evaluation inside this one. Click the appropriate add link to create the next element (you can find them below the most-recently added element). Enter the content of the heading, text, or question (see below) and click Save. Click to edit an element or to delete it. After adding the element, re-order it by clicking and dragging the symbol. 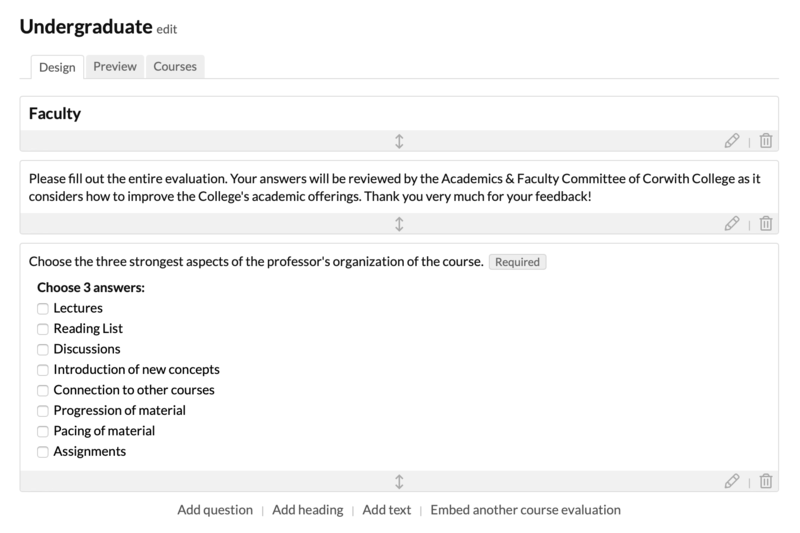 Click embed another course evaluation to insert another evaluation as a single element into the body of your evaluation. Type your question in the text area. Select the question type (see below). Depending on the question type you select, you'll see different options (labels, statements, etc.). These options are described below with the question types. Check whether this question is required or not. 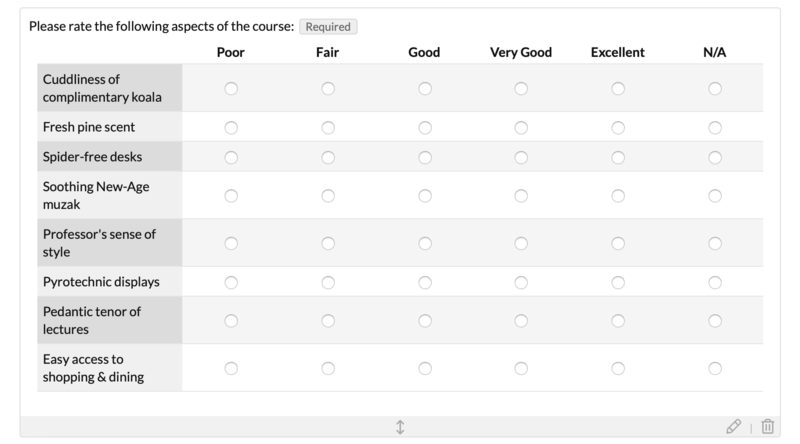 Select whether the question applies to the course or to the course faculty (which includes teaching assistants, if any. This lets students evaluate a number of individual items or statements on some sort of sliding scale. Here's an example. Select a number of labels (in the example, the options along the top). Enter the names of the labels (Good, Poor, etc.). Statements are the items you want your students to evaluate (the left column in the example). Enter as many statements as you like. Students enter free-form text answers. If you wish, you can limit the number of characters students can enter in their answers. Gives your students a large text area for an essay-length answer. If you wish, you can limit the number of characters students can enter in their answers. Your students select one of several answer options. This type restricts your students' answers to a numerical input. You have options to enter a minimum, maximum, or a range of number values. Your students check Yes or No in response to your statement. Your students choose one or more answers from a list of options. First, have a look at Preview to see how the evaluation will appear to your students. Then, go to the Courses view to attach it to courses. Select a term from the drop-down. If needbe, type in the filter to pare down the course list. Check off the courses to which you wish to attach this evaluation. If a course is half-toned, it is disabled. Disabled courses already have another evaluation attached to them. Un-checking a course disassociates the evaluation from the course (and makes the course available for other evaluations). When you're done, click Attach to these courses at the bottom of the course list (even if you've removed courses from the evaluation). 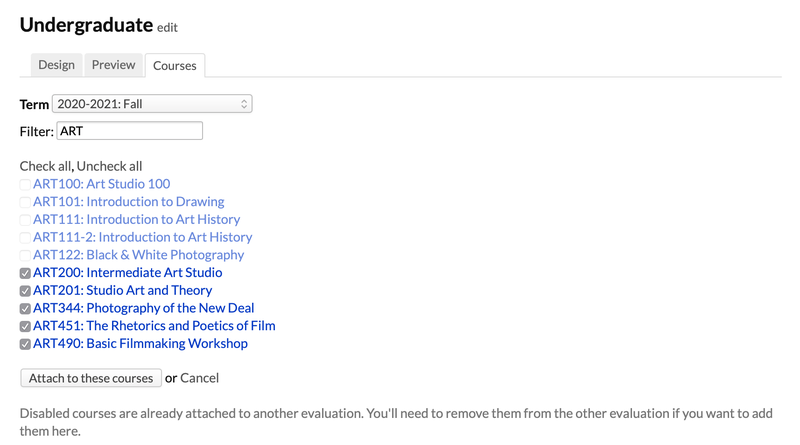 Finally, set the evaluation's availability on the Academic Term page. You can then adjust it, if necessary, for individual courses on the Course > Info view. ...and any combination of the above. Click Export to create a spreadsheet of the report's results. Click Print to create a PDF of the report's results.